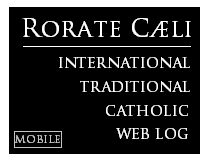 RORATE CÆLI: 3 prelates appeal to prayer: "That Pope Francis may confirm the unchanging praxis of the Church with regard to the truth of the indissolubility of marriage"
"That Pope Francis may confirm the unchanging praxis of the Church with regard to the truth of the indissolubility of marriage"
Cohabitation more uxorio with a person who is not one's legitimate spouse represents, at the same time, an offense to the Covenant of Salvation, of which sacramental marriage is a sign (cf. Catechism of the Catholic Church, 2384), and an offense to the nuptial character of the Eucharistic mystery itself. Pope Benedict XVI revealed such a correlation when he wrote: "The Eucharist inexhaustibly strengthens the indissoluble unity and love of every Christian marriage. By the power of the sacrament, the marriage bond is intrinsically linked to the Eucharistic unity of Christ the Bridegroom and his Bride, the Church (cf. Eph. 5:31-32)" (Apostolic Exhortation Sacramentum caritatis, 27). The admission of the divorced and "remarried" to Holy Communion constitutes in practice an implicit dispensation from the observance of the Sixth Commandment. No ecclesiastical authority has the power to concede such an implicit dispensation in a single case, or in an exceptional or complex situation or with the goal of achieving a good end (as in example the education of the children born of an adulterous union) invoking for such a concession the principle of mercy, or the "via caritatis," or the maternal care of the Church or affirming not to want to impose many conditions to mercy. St Thomas Aquinas said: "In no circumstances should a person commit adultery (pro nulla enim utilitate debet aliquis adulterium committere)" (De Malo, q.15, a.1, ad. 5). "Error when not resisted, is accepted. Truth, which is not defended, is oppressed” (Pope St Felix III, +492). 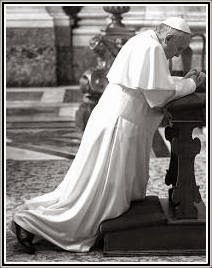 "Holy Father, God has elected you in the Church, so that you might be an instrument for the stamping out of heresy, the confounding of lies, the exaltation of the Truth, the dissipation of darkness and the manifestation of light" (St Catherine of Siena, +1380). "Oremus pro Pontifice nostro Francisco: Dominus conservet eum, et vivificet eum, et beatum faciat eum in terra, et non tradat eum in animam inimicorum eius. Tu es Petrus, et super hanc petram aedificabo Ecclesiam Meam, et portae inferi non praevalebunt adversus eam."